Introduction: The Warehouse and Stockroom Assistant Training Course is designed to introduce you to the fundamental principles of warehousing that progress your warehouse procedures, develop your supervisory management skills and knowledge in warehousing and stockroom to support career development and productivity in operations. 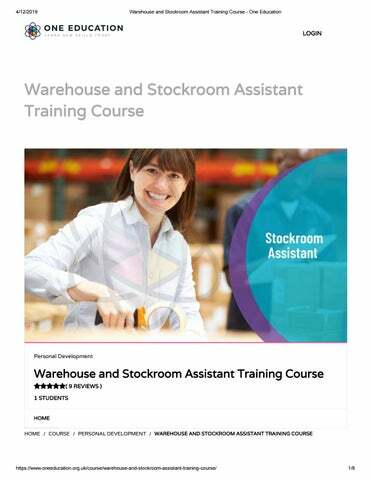 Description: With this course, youâ&#x20AC;&#x2122;ll learn useful methods for growing productivity, assisting stockroom sta in organising and managing stockroom, reducing costs, improving customer relations, storing shipping materials in stockrooms, maintaining employee health and safety, and lessening adverse environmental impacts. This course is suitable for individuals with very less knowledge of the supply chain eld, current challenges associated with warehouse management but desiring to establish a career in the sector. How is the course assessed? To successfully complete the course you must pass an automated, multiple-choice assessment. 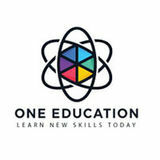 The assessment is delivered through our online learning platform. You will receive the results of your assessment immediately upon completion. Upon successful completion, you will qualify for the UK and internationally-recognised professional quali cation and you can choose to make your achievement formal by obtaining your PDF Certi cate at a cost of £9 and Hardcopy Certi cate for £15. Why study this course Whether you’re an existing practitioner or aspiring professional, this course will enhance your expertise and boost your CV with key skills and an accredited quali cation attesting to your knowledge. The Warehouse and Stockroom Assistant Training Course is open to all, with no formal entry requirements. All you need is a passion for learning, a good understanding of the English language, numeracy and IT, and to be over the age of 16.